What is the right walking stride technique? You want to use the full potential of your push off so you are using the power of your leg muscles. You might wonder whether a longer or shorter stride is better, and the answer is that you want to give a good push off in back but you don't want to overstride in front. Overstriding occurs when you take longer steps in an attempt to increase speed without running. However, overstriding is a poor technique to increase speed and it has a potential to lead to injury in the long term. Research done on soldiers who had to march in cadence found that those who were shorter had much more stress on their lower leg joints when forced to overstride to match the step rhythm. Lengthen the stride in back rather than in front to improve power and efficiency in your stride. An overstriding walker has their front foot too far out in front of body. You want instead for your forward foot to contact the ground closer to your body. Your stride should be longer behind your body, where your toe is pushing off, rather than out in front of your body. This is because your forward leg has no power, while your back leg is what is pushing you forward. You want to get the full power out of the push from the back leg, with the foot rolling through the step from heel to toe. 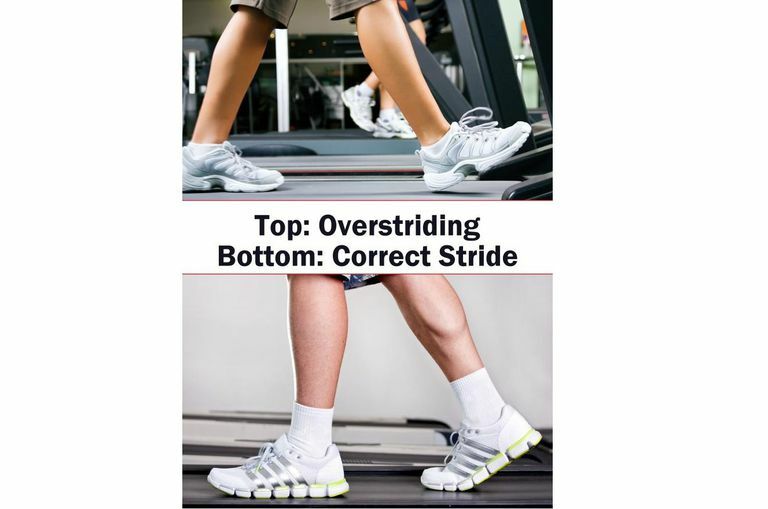 You will likely need some help to determine whether or not you are overstriding. Even if you are on a treadmill with a mirror, it can be hard to see while you're doing it. Instead, set up your cell phone or video camera to record yourself from the side on the treadmill or while walking on the sidewalk. Or, have a friend watch and observe. Work first on eliminating the overstriding. Keep your natural stride length, but learn to use it powerfully. Visualize your stride being longer behind your body, with your toe pushing off. Think of keeping your rear foot on the ground the maximum amount of time, to really roll through the step and give a good push off with the toes. The rear foot then passes under your body, knee flexing and driving forward but not up. After the foot passes by the other leg, the ankle then flexes and knee straightens (still think of driving forward, not up with the knee) to present the heel to the ground. The heel should strike the ground close to the front of the body, as it strikes the rear leg is rolling through the step and preparing to toe off powerfully and come forward. Open up your stride behind your body by concentrating on getting a full roll through the rear foot and good push off with the rear toes. If you find your feet slapping the ground in front, you likely have too stiff of shoes and/or weak shins. The shins will build with practice. But you will want to look into getting some more flexible shoes. Your hips should rotate with each stride front to back, not side-to-side. Do not concentrate on adding hip motion at first, it should come naturally as part of a good stride and push off. To go faster, fast walkers take more, smaller steps rather than longer steps. Use the powerful back part of your stride to move you forward, and increase the number of steps per second. Practice a correct walking stride by consciously keeping your rear foot on the ground longer with each step and giving a good push off. You will naturally place your forward foot closer to your body if you do this. This will retrain you away from overstriding. While it may feel strange at first, as you get into a rhythm you will feel the power that you get from the rear foot. Fast walkers train themselves to increase the number of steps they take per second and to get full use out of the back part of the stride. Instead of overstriding, take more, smaller steps to build speed. A powerful stride using the rear foot to propel you can help you maintain good walking posture and works well with good walking arm motion. Combined with rolling through each step, you will have the best walking technique. Whether you are just going for your daily fitness walk or you are tackling a half marathon, walking with good technique will make the most of your workouts. Seay JF, Frykman PN, Sauer SG, Gutekunst DJ. "Lower extremity mechanics during marching at three different cadences for 60 minutes." J Appl Biomech. 2014 Feb;30(1):21-30. doi: 10.1123/jab.2012-0090. Epub 2013 Apr 1.